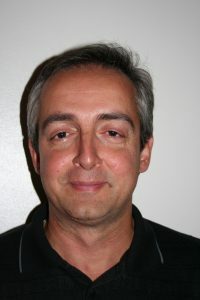 Dr. Nikolaos P. Papanikolopoulos is a McKnight Presidential Endowed Professor and a Distinguished McKnight University Professor in the Department of Computer Science at the University of Minnesota and Director of the Center for Distributed Robotics and SECTTRA. He provides a unique opportunity to the University of Florida the week of April 15, delivering two seminar talks in as many days, covering two very different topics. On Wednesday, April 17, Papanikolopoulos presents “From Ground Robots to Transformable UAVs: Applications to Precision Agriculture” at 10 am, 221 MAE-A. In this talk, the design of a modular hardware and software infrastructure will be discussed, as well as the placement and successful operation of these devices in the real world. Furthermore, he will discuss the art and science of designing these robotic systems. The following day, Thursday April 18, Papanikolopoulos will present “Computer Vision and Machine Learning for Cancerous Tissue Recognition,” 11:45 am in 310 Larsen Hall. In this talk, he will discuss the fact that for several visual learning applications, collecting large amounts of annotated data is either challenging or very expensive; one such domain is medical image analysis. The talk will describe how machine learning methods were devised with emphasis on Cancerous Tissue Recognition (CTR) applications.